A few weeks back I spotted an advert in the side bar of Jane's blog British Beauty Blogger that got me a little excited. The advert looked like it was for the Bourjois Rouge Edition Velvet's, but I noticed that the packaging was slightly different, so I guessed that a new product might be on the way. 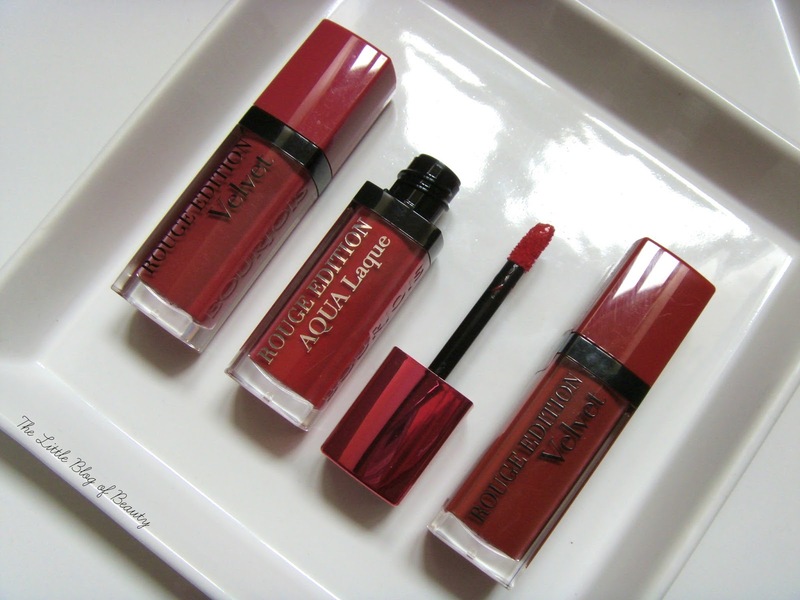 Shortly afterwards I discovered that Bourjois were releasing the Rouge Edition Aqua Laque's. As I'm a big fan of the Velvet's and have three of the original shades (three new shades have just recently been released) I knew I'd need to get my hands on one of the new Aqua Laque's to try. 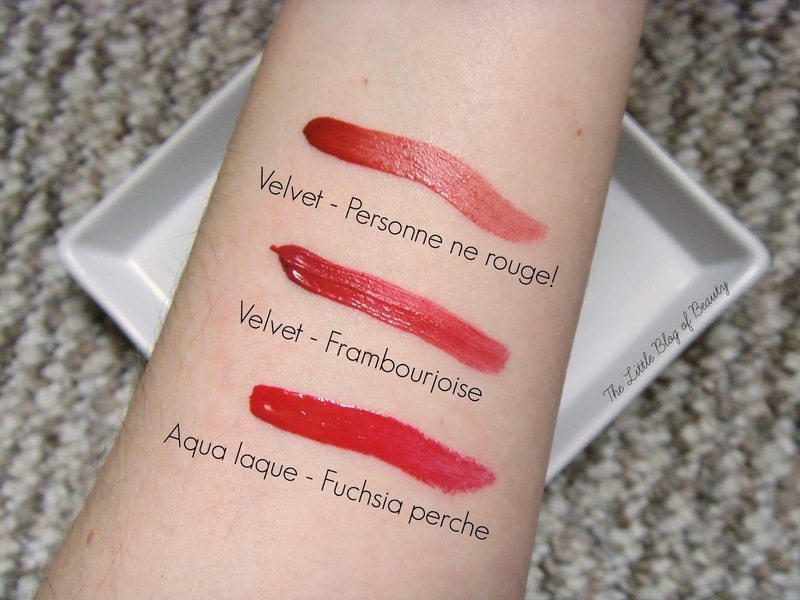 As the name suggests the Rouge Edition Velvet's have a velvet, almost matte finish, but the new Rouge Edition Aqua Laque's have a glossier finish. You can just about see from the swatches above that they do have a slightly different formula/texture. The Velvet's are a bit thicker whereas the Aqua Laque's have a lighter, slightly more water like formula. The Aqua Laque formula reminds me of the L'Oreal Glamshine stain splashes and also the Dior Fluid Sticks. These have exactly the same applicator as the Rouge Edition Velvet's but because of the difference in texture they do feel different to apply. I don't find the Velvet's heavy in any way but the Aqua Laque formula feels super light, just like water, and it has a cooling effect when first applied. I do find that this appears to apply slightly patchy at first but it then settles and evens out. Although these are supposed to be glossy I actually find that this disappears quite quickly. It doesn't become as matte as the Velvet's, but it also doesn't stay really glossy. This then fades down to leave a slight stain, but it's a stain that then fades quite quickly, it's not the type of stain you have to remove at the end of the day. I find that the Velvet's can last all day (if you're happy with the stain that they wear down to) but the Aqua Laque lasts probably a couple of hours at the most and doesn't stand up well to eating and drinking. I have to say I'm slightly disappointed with this, but this is only because the Velvet's set the standard so high in terms of lasting power and realistically because of the lighter, water like formula of the Aqua Laque's they can't stand up to this. I would say these are the spring/summer version of the Rouge Edition Velvet's. They're lighter, easier to apply (it's not as difficult to correct mistakes with these) and easier to reapply when required. 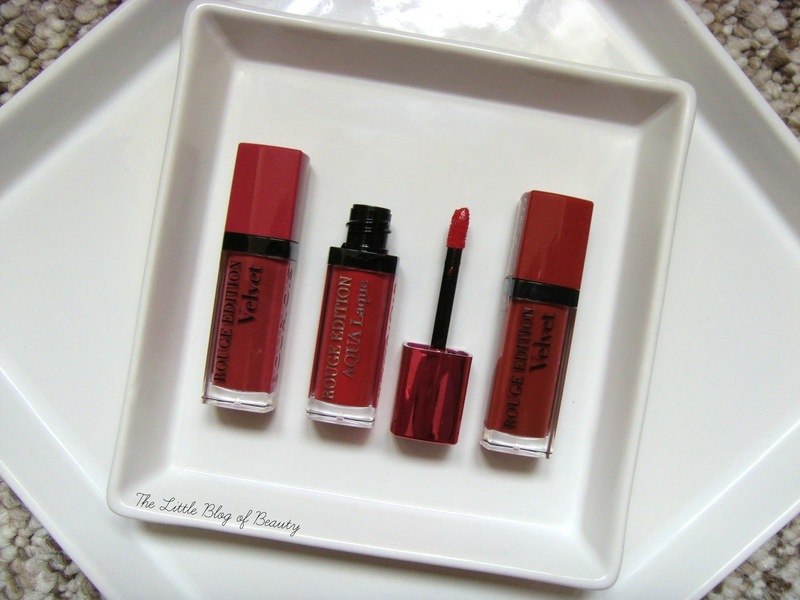 The Bourjois Rouge Edition Aqua Laque's are £8.99 each and are available from Boots and Superdrug. Have you tried an Aqua Laque yet? Glossier finishes tend not to last as long as mattes. I've never tried these out but they sound really great! Love the picks. Would love it if you could check out my latest Alexander McQueen fashion post!